On Friday 28 November we visited the prestigeous National College of Arts, where we were received by Prof. Ajaz Anwar. 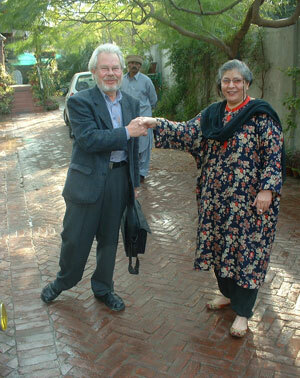 Staffan had already met him once, in February 2001 at a conference on Punjab studies in Coventry, U.K. Ajaz Anwar is Professor of Fine Arts, and he got his training in Istanbul, Turkey in the 1970’s . He also got his PhD degree from there. 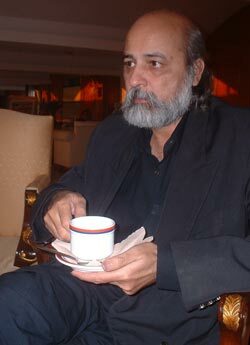 After that he worked for some time in Uganda, during the horror regime of Idi Amin, before he joined the National College of Arts, NCA, in Lahore in 1980. Prof. Ajaz Anwar showed us around in the premises of this very interesting and perhaps unique college of arts, started as early as 1864 and situated next to the famous Lahore Museum. 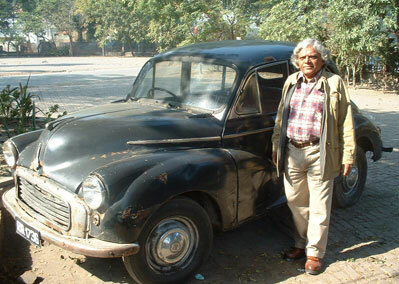 Prof. Ajaz Anwar with his car. At the NCA architecture, design, painting, graphics, art history, musicology, media & communication, cultural analysis and social sciences, are taught in undergraduate courses lasting three to four years. Some masters courses are taught on top of that, and PhD training was recently introduced in the area of Communication. Some 700 students study presently at NCA, out of whom quite a few are girls. Several students proceed for their studies overseas. There also used to come a number of foreign students to the NCA, mostly from Arab countries, Palestine, Iran, etc., but due to the worsened political situation in the Middle East this flow has diminished. At present only one Turkish student is there along with two students from America and from England, all of them having a Pakistani background. They study on what is called ‘foreigner’s seats’, which means that these student can attend the whole degree programme at slightly higher fees. Swedish students would be welcome here. Ajaz ensured that they would be accommodated in a nice hostel – separate for boys and girls. Abdul Hameed whom we met two days earlier, see http://www.sasnet.lu.se/lahore1.html, once was a student of this college. Ajaz Anwar (standing in front of his vintage car on the photo above) thinks that Hameed, with his Swedish contacts, could become a liaison person and promote further student exchange between Sweden and Pakistan. Ajaz had just had an exhibition of his vivid paintings of old Lahore, and the pictures were still up in one of the exhibition halls of the College. 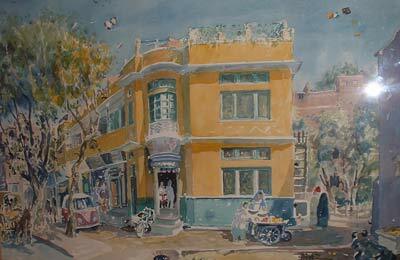 (A painting of his childhood home in Lahore is shown to the left). He is widely known for his paintings all over the World and maintains a rich contact network. In September 2004 he has been invited to exhibit his works in Krakow, Poland, and is likely to go. In the other exhibition hall there was an exhibition of students’ works on globalisation and its effects, very ingenious paintings and collages! 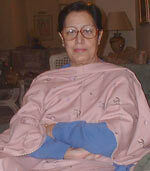 Ajaz has a strong feeling for times past and especially the city culture of Lahore in the 1940–1960s. Development should not be at the cost of culture. He deplores the erosion of the joint family system in the West, and the break up even of marriages. What a loss to humankind, ending up in people living alone, becoming two halves, and at much higher cost for the individual and society. He favours an eclectic style in building constructions and architecture. Each material, concrete, bricks, and wood, has its function and has to be used according to the climate. Wood is vulnerable here since it is destroyed by termites. We presented SASNET and our ambition to create increased cooperation and exchanges in the academic fields. This led to a number of questions regarding research going on in Sweden. We were impressed by the competence and different angles and viewpoints that the college has developed. It must be a very enriching experience for the students of architecture, fine arts, graphics, etc., to attend these varied programmes. Especially the mixing of substantial portions of cultural analysis, social sciences and history into the curriculum make a very innovative impression. The Department of Academics has three doctoral students in Media and Cultural analysis, guided by Durree Ahmad and Suroosh Irfani. The latter worked as a university teacher in Iran for 20 years, up to the beginning of the 80’s. 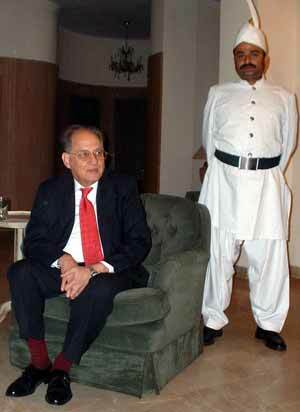 He witnessed the Islamic revolution in 1979 and the subsequent take over of power by the mullahs. After returning to Pakistan he wrote extensively about this experience in The Muslim, a radical daily at that time. He also published a book on Zed Press in 1983 (and was coincidentally interviewed by the Swedish magazine Vi sometime in the Winter 1983/84). In their teaching at NCA Durre and Suroosh both focus on cultural developments and transformations in Pakistan and the Muslim world. They regret the absence of radical intellectual and cultural reform movements and discourses in the contemporary situation, an active response to the modernisation and ‘post-modernisation’ trends in the west. They would like to see an open dialogue with Western literature. Issues of modernity and post-modernity, for example ‘individualism’, need to be discussed. The Sufi tradition in South Asia with its emphasis on the affective dimension has been very important through the ages. What is the fate of the Sufi text in the contemporary situation? Will it be transformed in the new situation where the spread of the puritan Wahabi form of Islam from Saudi Arabia, from 1970’s onwards, partly has overshadowed the Indo-Islamic–Persian culture with the strong Sufi tradition, that used to dominate in Pakistan earlier. Much of their academic interest focuses on the history of the colonial period. They have studied the so-called New Light Movement among Muslims in the 1860/70s, that was a synthesis of Oxford education and the Indian context at that time. 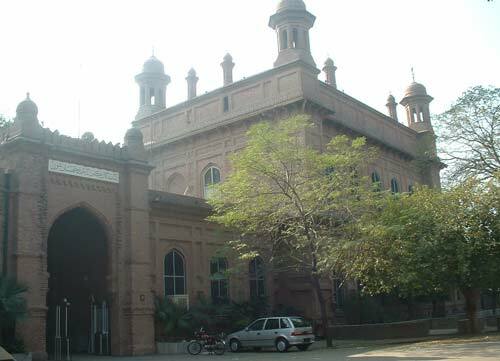 It was the basis for establishing the Muslim Aligarh University. One of their the doctoral students has chosen this as topic for a dissertation, another one focuses on gender and media. They would welcome researchers from outside to come and teach and do research at the NCA. Durree and Irfan mention the intellectually strong Pakistani writer Eqbal Ahmad, who returned to Pakistan some 15 years ago after teaching for many years in the US. He was a Pakistani counterpart to Noam Chomsky, Tariq Ali, and Edward Said, and his book ”Confronting Empire” has been widely circulated. Now there is an annual Eqbal Memorial Lecture. Pervez Hoodbhoy, Quaid-e-Azam University, Islamabad, is involved in organising these lectures. One of the NCA teachers, Dr. Lala Rukh (photo to the right) , was very active in the women’s movement in the 1980s, and is currently working with gender analysis, just like Durre Ahmed who has published an anthology ‘Gendering the Spirit. Women, Religion & the Post-Colonial Response’ (published by Zed Books 2002), which analyses the spirituality and resistance of women in various creeds: Hinduism, Islam, Christianity and Buddhism. Dr. Sajjad Kausar from the Dept of Architecture has specially focussed on Mughal gardens in his research, which has included studies in India and Iran, and he has initiated a teachers exchange programme between NCA and the Landscape College at Versailles, outside Paris, France. He has also brought students with him to Paris. Dr. Syed Maqsood Pasha from the Multimedia Programme also informed us that his department is involved in an exchange programme with a French university as well. Faculty members and students have gone to the University of Aix-en-Provence as part of this exchange. Sajjad Naseer is especially interested in the Kashmir conflict and Indo-Pak relations, and we suggested that a possible partner could be Dr. Sten Widmalm, Dept. of Government, Uppsala University. Prof. Khalid Aftab from the prestigeous Government College had once visited Sweden, to take part in the 1983 European Conference on Modern South Asian Studies, held that year in Tällberg, Dalarna. Prof Aftab expressed his interest in research collaboration on industrialisation, especially small scale industrialisation. We suggested as possible partners Alia Ahmad, Dept. of Economy, Lund University, and Hans Jansson, business economist, Kalmar University. Sarwat Ali (photo to the right) is interested in classical music of South Asia, which is also the research focus of the department of musicology at the National College of Arts. It is the first institution of its kind to be set up in Pakistan in 2001, and he informed us about their 4-years BA programme. We don’t know of any researcher in Sweden interested in this field, but Sarwat Ali says that the ethno-musicological tradition would be interesting for Pakistan, where such methods and approaches have not been practised so far. Mansoor H. Khan told us that the complete laws of Pakistan are not available in print to the public, only at some public libraries, with limited access. So how can people and business follow the laws if they do not even know its content. How can lawyers work. And what about the judges and other executives, will they rule arbitrarily? He said Pakistani lawyers needed more knowledge about WTO since it was to be fully implemented by 2005. Prof. Fehmida Jalil, King Edward Medial College, University of Punjab, and Prof. Shaukat Raza Khan, Fatima Memorial Hospital Medical College & Dentistry, Lahore (photo to the right), had invited us for dinner in this most prestigious and oldest of the clubs in Lahore. It has a limited membership of only 300 persons, mainly from the higher government civil services. Servants provided us with the compulsory ties and we sat down for a conversation near the open gas stove in Nishan Hall, one of the comfortable drawing rooms of the club. Later we had a nice western style four course dinner. Dr. Jalil and Shaukat Raza Khan told us about their work at the Department of Paediatrics at the King Edward Medical College. They have been involved in a PhD sandwich programme with Karolinska Institutet Medical University for 15 years, which has resulted in no less than seven PhD students completing their theses. The active counterpart in this has been Prof. Bo Lindblad, Dept of Public Health Sciences, Division of International Health (IHCAR), Karolinska Institutet, and later Prof. Lars-Åke Hansson from the Dept. of Clinical Immunology, Sahlgrenska Academy, Göteborg University. 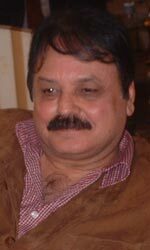 Since he retired Prof. Shaukat Raza Khan has now become the Principal of a private medical college, the Fatima Memorial Hospital College of Medicines & Dentistry, at New Garden Town in Lahore. The college has about 350 students. It is financed by a trust led by two sisters with private wealth. Both Dr. Jalil and Dr. Shaukat Raza Khan think that there has been steady improvement in child health in Pakistan since the early 1960s when they started to work in this field. They have both been very active in immunisation programmes and they claim that there were no or very few cases of undernourished children 0-2 years coming to the hospitals nowadays. Professor Fehmida Jalil has had a long and ambitious career, creating six departments of Preventive Paediatrics now running in Pakistan, including the one at King Edward Medical College. She also started the first vaccination centre in Pakistan, and after training the staff and monitoring the output, handed it over to the Government for an Extended Programme of Immunization. In the late 1960’s she ran her first nutrition rehabilitation centre, which she has subsequently increased to 11 centres in poor communities. Professor Fehmida has, after a survey of the attitudes and practices of families and care providers at the time of delivery developed protocols for training Traditional Birth Attendants for home deliveries. She has adapted the WHO/UNICEF manual on ”Breastfeeding Promotion and Lactation Management” for local use and provided training for 26 districts and seven teaching hospitals, in addition to a community based campaign for breastfeeding in two large districts. In addition to a considerable list of scientific publications she is the author of five books in local language for health care providers. As early as in 1964 she started a community based cohort study to determine the health determinants of children in poor slums. This was extended through the Swedish collaboration, and the same individuals have now been revisited for follow up studies of the late effects of malnutrition in life before birth. PS. 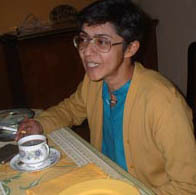 On 17 March 2004 Uppsala University awarded the 2004 Rosen von Rosenstein medal to Professor Emeritus Dr. Fehmida Jalil. She was thereby honoured for the 40 years she has been involved in cooperation with five different Swedish universities, working on projects related to preventive paediatrics in Pakistan. The award ceremony took place in Uppsala University’s Gustavianum hall. Earlier the same day she held the traditional Rosen lecture in the Grönwall hall. The lecture dealt with ”Perinatal problems in Pakistan”.